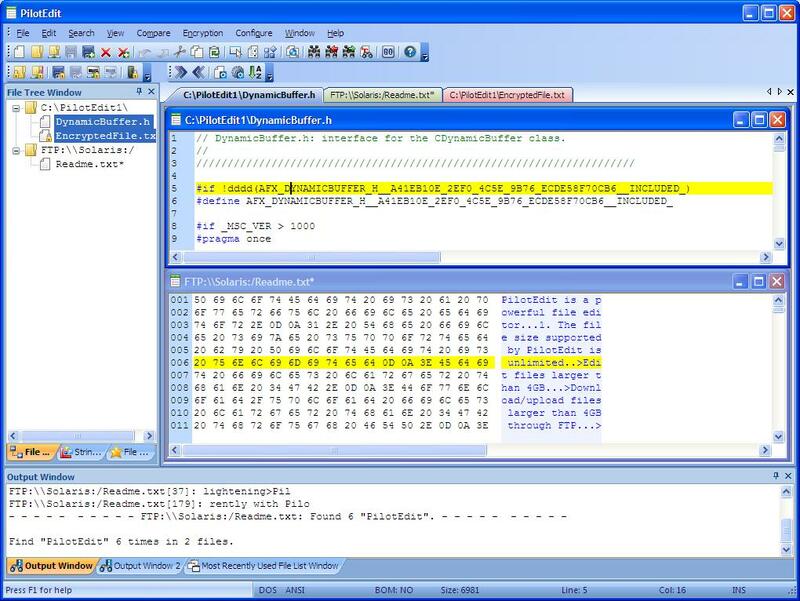 PilotEdit is an advanced text and hex editor that supports opening of files larger than 4GB. It offers customizable syntax and keyword highlighting, advanced search and replace operations, automatic text encoding, 256-bit AES encryption/decryption, and a built-in FTP client lets you open, edit&upload files directly to/from an FTP server. In addition to standard text editing features, PilotEdit can compare and merge two files larger than 100MB. a file editor to edit, download, upload, compare, merge and encrypt huge files. ...... In addition, you can sort, find/remove duplicated lines and collect strings over a file larger than 1GB. PilotEdit will automatically detect start tag and end tag. PilotEdit is a powerful file editor taht is able to edit files larger than 4GB. You can also download/upload files larger than 4GB through FTP. This tool is capable to encrypt/decrypt files larger than 4GB and to compare them. UNICODE files and DOS/UNIX files are fully supported by PilotEdit. Change encoding of multiple files from one kind of encoding to another. PilotEdit will adjust text encoding automatically when you copy/paste between files of different encodings. PilotEdit supports more than 20 kinds of file types. You can define your own file types and different TAB and indent for different file types. For example, a user may input TAB for C/C++ and four blanks for Java by presses "TAB". What is new in PilotEdit version 5.4.0? PilotEdit 5.4.0 has made improvement over file comparison. Qweas is providing links to PilotEdit 5.4.0 as a courtesy, and makes no representations regarding PilotEdit or any other applications or any information related thereto. Any questions, complaints or claims regarding this application PilotEdit 5.4.0 must be directed to the appropriate software vendor. You may click the publisher link of PilotEdit on the top of this page to get more details about the vendor.